It’s no secret that I’ve been posting a lot of “indulgent” dairy-free recipes lately. Namely my Key Lime Pie and Raspberry Cheesecake Brownies. Why? Well, partially because it’s just that time of year – my body is craving warm, comforting foods AND Valentines Day just so happens to be right around the corner. And who doesn’t love a satisfying and delicious home cooked meal on Valentines Day? Not only has the season been influencing me but I think I’m also trying to prove to myself that giving up dairy wasn’t all that big of a sacrifice and that I am doing just fine. Don’t get me wrong, I LOVE cheese and encourage anyone that can eat it, to do so (as long as it’s Organic, grass-fed and preferably raw) but personally, I’ve learned that it just doesn’t cooperate with me. Thankfully, giving up dairy has forced me to be even more creative in the kitchen and the result has been some pretty epic, dairy-free meals. 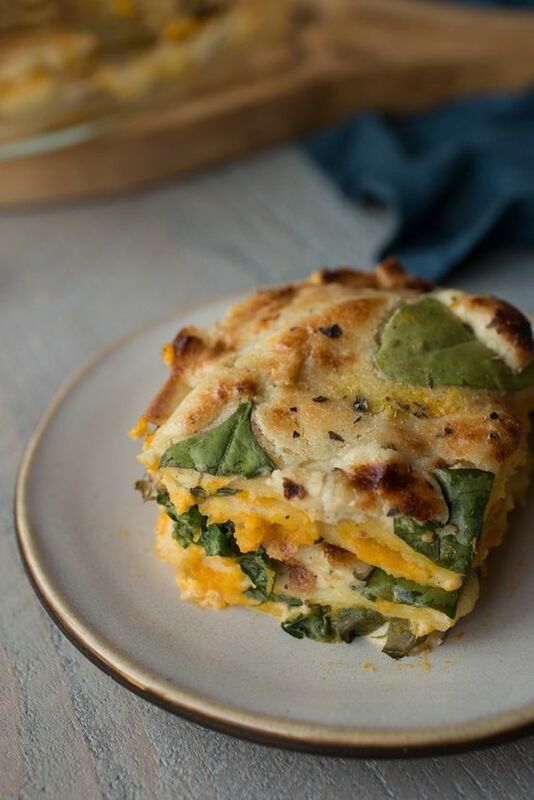 I am super excited to share this one with you… because it’s pretty darn hard to envision lasagna without cheese, but this one really doesn’t need it. 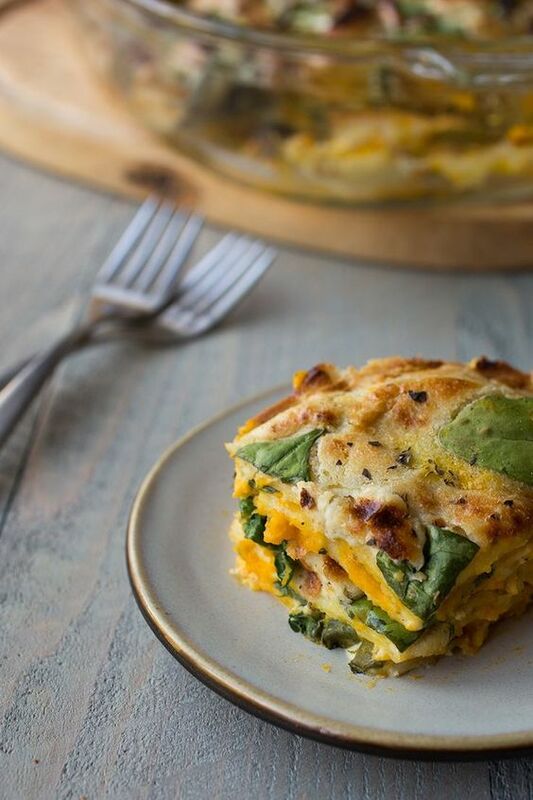 Primal Palate has an absolutely fantastic lasagna recipe using zucchini noodles but I’ve really yet to find another recipe that doesn’t BEG for cheese. This recipe uses “real” noodles, but I’ve opted for the most paleo-friendly packaged pasta you’ll find anywhere – Cappello’s. All of their pasta is pretty phenomenal! Having said that, this recipe will work with most lasagna sheets if you have something else on hand. Slice butternut squash long ways, scoop out the seeds and spread ¼ tablespoon olive oil on each side. Top with a bit of salt and pepper. Lay face down on a parchment-lined baking sheet and bake for 30-40 minutes until soft. While the squash is baking, combine all "cheese" ingredients in a high-powered blender and blend until completely smooth. Remove butternut squash from the oven when it's done, flip and allow to cool for 20-30 minutes. Once cool, gently slice off the skin and add to a food processor. Add remaining butternut squash ingredients (including the remaining 3 tbs olive oil) to the food processor and pulse until combined but not overly smooth. 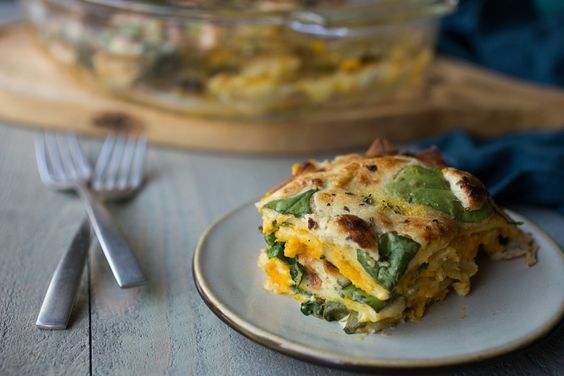 In a 9x13 inch or similar baking dish, layer 3-4 layers of butternut squash, pasta, cheese, spinach, butternut squash and ending with pasta as the top layer. 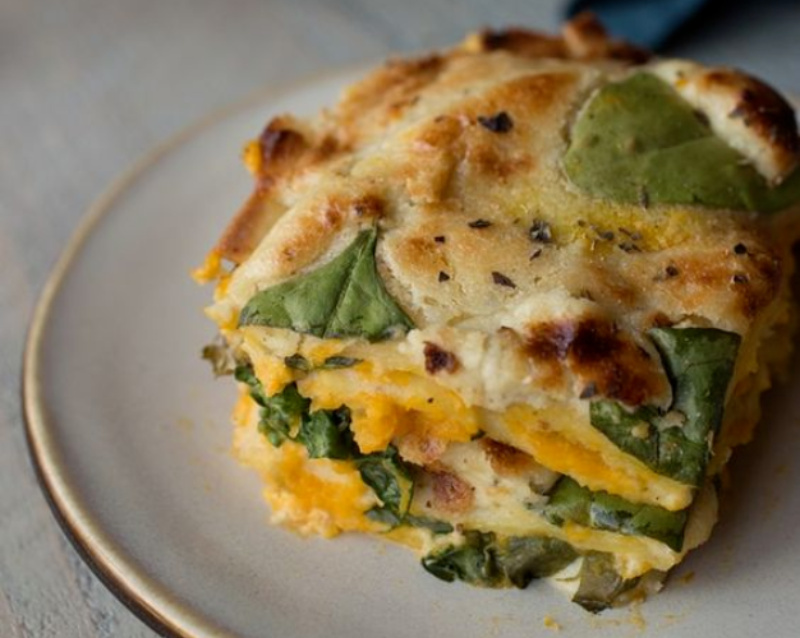 Save one layers-worth of cheese and spinach that you will spread on top of the pasta closer to the end of cooking. Cover baking dish in foil and bake at 350° for 30 minutes. Remove foil and add remaining cheese and spinach and cook for another 10 minutes. Remove once more and change to broil. Place uncovered lasagna under the broiler and cook for about 5 minutes. Keep a close eye on this - cooking times can vary. Make sure the top is only cooked so much as that it just browns, but doesn't burn. Remove, cool for 5 minutes, slice and serve! Thank you for the recipe! It looks amazing. I was craving dairy free lasagna so bad yesterday. One question, do you slice the butter nut squash or purée it, or something else? This recipe looks amazing! I had a question. How long do you soak the cashews for before draining? Thanks! Just a few hours is fine! You could also do it overnight but I wouldn’t soak them for more than 12 hours tops. If you do it overnight, just cover it with a cloth. Doesn’t pasta have flour in it making this not a true paleo dish? For this dish I use Cappello’s which is made with tapioca and almond flour so it’s grain-free. As I mention in the post, this is the most paleo-friendly pasta you’ll find. It’s still a treat, so not something to have every day, but I consider dishes like this occasionally are fine in my personal version of a paleo diet.